Record number of competitors signed up for SkillFRIDGE! 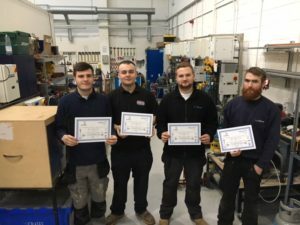 SkillFRIDGE, the national, refrigeration, air conditioning and heat pump competition sponsored by Toshiba, is enjoying a record year in terms of student participation. Over 42 registrations were received ahead of the April 7 deadline, its highest number ever. Qualifying heats are being held in colleges and training centres around the country. Students competed at Southern Regional College’s Portadown campus on 24 March; Glasgow College on 28 March; Cardiff & Vale College on 6 April and at Eastleigh College on 27 April. The remaining heats will take place at Grimsby College on 21 June and North Kent College on 19 July. The six highest scores from the regional heats, plus last year’s winner, will be invited to the final held at the NEC as part of The Skills Show in November. The final incorporates RAC level 2 knowledge and practical tasks including charging and recovery of refrigerants to Fgas 2079 (cat 1) standards, plus elements of Level 3 RAC. In addition to Toshiba as lead sponsor, equipment suppliers and sponsors include A-Gas, Advanced Engineering, Dean & Wood, Refrigeration Wholesale, Vulkan Industries and Fieldpiece. ACR Refrigeration Training and Business Edge are Training Providers. The event is supported by a number of Associations including FETA; The Institute of Materials, Minerals and Mining and the Institute of Refrigeration (IOR). It also has support from three other industry leading events, the ACR News Awards, the HVR Awards and the HVAC & Refrigeration Show. “We have also had the opportunity for a specialist to demonstrate the Safeflame® brazing unit (a new safer flame from water) which is the result of an EU funded project for the HVAC and education sectors,” says Mark.